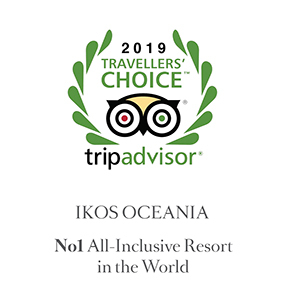 Ikos Resorts are found in spectacular locations – each with a private secluded beach, several pools for you to choose from and acres of landscaped gardens for you to explore. Basking in the enticing Dodecanese sunshine on the southwest coast of Kos island, Ikos Aria offers a compelling mix of contemporary style and traditional hospitality. In the heart of Halkidiki, the intimate Ikos Oceania offers spectacular views across the Mediterranean. With a private beach, magnificent pools and limitless choices, guests soon discover that everything is perfectly in place. Relishing its exclusive location on the Gulf of Toroneos, this contemporary Greek masterpiece extends across a perfectly landscaped 22 acres framed by an exclusive white sandy beach. The sophisticated style and first-class offering of Ikos Olivia offers discerning travellers the warmest of welcomes. Framed by pine trees and with the turquoise Ionian Sea stretching out before, Ikos Dassia is a tranquil oasis on the cosmopolitan island of Corfu. Mediterranean style meets traditional Greek hospitality in this luxurious resort where the finest food, service and accommodation ensure an unforgettable experience awaits you.